"A. R. Hopkins and Son" was a bakery in the South Wales town of Port Talbot, and Anthony Hopkins was the "Son" on the sign, but he had little interest in baked goods. He was a poor student, dyslexic and often in trouble for his wandering attention in class. He knew he wanted to be an actor from his first appearance on stage, in local YMCA productions in his teens. And he remembers well the day a regular customer at the bakery brought her brother -- Richard Burton -- into the shop for a pastry. As Burton strolled away and passers-by stopped to greet him, Hopkins decided that he would not only be an actor, but a famous actor. He began his professional career in local and regional productions in 1960, but still supported himself with a day job in an office. He served as a gunner in the Royal Artillery, and after leaving the military he studied at the prestigious Royal Academy of Dramatic Art. Success came slowly, but Laurence Olivier befriended the young actor and became his mentor, and by the mid 1960s Hopkins was a minor celebrity for his work on the London stage. He first appeared on film in 1967, with a small role in a somewhat deranged road trip drama titled The White Bus. The next year he earned raves as King Richard in the royal drama The Lion in Winter with Katharine Hepburn and Peter O'Toole. Over subsequent decades Hopkins became a mid-level movie star. Prior to The Silence of the Lambs he was probably best known as the ventriloquist who battles his dummy in Magic with Ann-Margret, the doctor who cared for John Hurt in The Elephant Man, Captain Bligh in The Bounty with Mel Gibson, or the bookseller who became Anne Bancroft's dear pen pal in 84 Charing Cross Road. He also worked in numerous highbrow television miniseries like The Edwardians, War and Peace, QB VII, and Great Expectations. 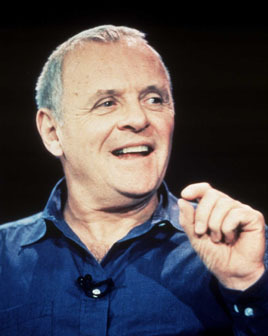 Of course, he will always be known for his screen-stealing and Oscar-winning role as the murderous gourmet Hannibal Lecter in The Silence of the Lambs with Jodie Foster. Hopkins obviously had a blast in the role, and lines like "I ate his liver with some fava beans and a nice Chianti" quickly became comical catch phrases. After more than twenty years of film work, Hopkins was finally an A-list star, with his choice of roles. He played the hypocritical widower in Howards End with Vanessa Redgrave, a stuffy C. S. Lewis in love with Debra Winger in Shadowlands, the heartbreakingly repressed British butler in Remains of the Day with Emma Thompson, an elderly swashbuckler in Mask of Zorro with Antonio Banderas, Tom Cruise's boss in Mission: Impossible II, and a speed-racing New Zealander in The World's Fastest Indian with Diane Ladd. He has played two American Presidents, a mildly deranged Richard M. Nixon in Oliver Stone's Nixon, and John Quincy Adams arguing for a slave's freedom in Amistad. He also narrated the 2000 film of Dr. Seuss' How the Grinch Stole Christmas with Jim Carrey. His mother, Muriel Yeats, was distantly related to the poet William Butler Yeats. Hopkins' daughter, Abigail Hopkins, is a one-time actress who appeared in two of her father's films, Shadowlands and The Remains of the Day. She is now a recording artist of some renown in the UK, creating a "textured mixture of blues, folk, and rock." Father and daughter, however, have been estranged for years, and in a 2002 interview the actor admitted he did not know where his daughter was living, other than "in England somewhere." Hopkins was married to his second wife for thirty years, but they spent very little of that time together -- she lived in London, he lived in Hollywood, and he has said their marriage devolved to a somewhat distant friendship, with little more than occasional chats by phone. His ex-wives describe Hopkins as a loner, a man who withdrew inside himself when he was not performing. He struggled with alcoholism for many years beginning in the mid-1960s, and credits Alcoholics Anonymous for his success in that battle. "My name is Tony," he said at many meetings, "and I'm an alcoholic." He has been sober since a morning in 1975 when he woke up in Arizona with no notion how he got there. Hopkins has lived in the United States since the early 1970s, and became a citizen in 2000. His oath of citizenship ceremony was filmed by longtime friend Steven Spielberg. Hollywood Walk of Fame 24-Sep-2003 at 6801 Hollywood Blvd.